Introduction Home-based self-rehabilitation programmes combined with botulinum toxin injections (BTIs) appear to be a relevant approach to increase the recommended intensive rehabilitation of patients with spasticity following a stroke. The literature highlights a lack of evidence of beneficial effects of this adjuvant therapy to reduce limitations of patients with stroke. The aim of this study is to assess the effects of a 6-month self-rehabilitation programme in adjunction to BTI, in comparison with BTI alone, to reduce limitations of patients with spasticity following a stroke. Methods and analysis 220 chronic patients will participate to this multicentre, prospective, randomised, controlled, assessor blinded study. All patients will benefit from two successive BTI (3 months apart), and patients randomised in the self-rehabilitation group will perform in adjunction 6 months of self-rehabilitation at home. All patients continue their conventional physiotherapy. The main outcome is the primary treatment goal (PTG), which will be determined jointly by the patient and the medical doctor using Goal Attainment Scaling. Impairments and functions, quality of life, mood and fatigue will be assessed. Botulinum toxin will be injected into the relevant muscles according to the PTG. Patients in the self-rehab group will be taught the self-rehabilitation programme involving respectively 10 min of stretching, 10 min of strengthening and 10 min of task-oriented exercises, corresponding to their PTG. Compliance to the self-rehabilitation programme will be monitored. Ethics and dissemination Patients will sign written informed consent. Ethical approval was obtained from ethics committee. The results will be disseminated in a peer-reviewed journal and presented at international congresses. The results will also be disseminated to patients. This study is the first to assess the effects of a self-rehabilitation in addition of usual treatments over a long period (6 months). This study will include a large sample with patients from 16 hospitals across all the country. The design of this study (randomised, controlled, assessor blinded study) tends to meet the highest level of evidence. This study would permit to apply recommendations to improve patients limitations with little additional cost to the already limited health system budget. Physiotherapy has been shown to be effective for the treatment of motor impairment and the improvement of function following stroke.13 14 Different techniques have been developed, however, one has not been shown more effective than another.15 16 Nevertheless, it has been demonstrated that the intensity, the frequency and the specificity (to train specifically the task to improve) of physiotherapy is positively correlated with recovery.17–20 To increase the duration and the specificity of physiotherapy lead indeed to greater improvements in impairments and functional limitations. French et al 21 published a systematic review relating positive effects of repetitive functional task practice on upper and lower limb function in 1078 patients with stroke.21 Van de Port et al 22 showed indeed that intensive circuit training organised in specific workstations induced greater locomotor improvements than usual physiotherapy in 250 chronic outpatients with stroke.22 This likely suggests that patients do not attempt their maximal potential of recovery when they benefit of usual care. This means also that an adjuvant care might permit to the patients to reach their maximal capacity and thus reducing the impact of impairments and functional limitations. Moreover, many studies highlighted that improvements continue and are effective in chronic patients with stroke who follow intensive active rehabilitation.13 23 Currently, because of the constraints within the French health system, patients with stroke living at home usually receive only 1.7 sessions of 20–30 min of physiotherapy per week.24 These sessions, which last about 30 min, usually only consist of stretching and strengthening exercises. This contrasts with recommendations of intensive rehabilitation for chronic patients due to functional deteriorations observed when patients decrease or stop their rehabilitation.19 20 25 This suggests the necessity to develop novel approaches which could increase the intensity and specificity of rehabilitation for chronic patients with stroke living at home. A self-rehabilitation (SR) programme appears a relevant approach to increase the intensity of the oriented rehabilitation which is needed and further improve recovery of these patients. The treatment commonly used to reduce spasticity and increase functions in patients with stroke is botulinum toxin injections (BTIs).12 26–28 In the upper limb, BTI appear associated with a global moderate treatment effect and depends of the parameters studied. A meta-analysis carried out by Foley et al 29 showed a relatively large effect size for the reduction of spasticity and the improvement of passive function and, a small effect size for the improvement of active functions such as prehension.29 This confirms the results of a previous international consensus statement in which authors consider BTI as effective for reduction of pain, deformity and improvement of washing and dressing (class I evidence, recommendation level A), but no clear benefit in active function (class III evidence, recommendations C).30 In the lower limb, several studies have evaluated the effects of BTI in the rectus femoris (RF) and triceps surae muscles in patients with stroke. Studies have shown that BTI in the triceps surae reduced passive resistance to ankle dorsiflexion, pain and the requirement of a gait aid and increased gait speed of patients with hemiparesis.31 32 An open-label study found a significant increase of 8° peak knee flexion during swing following BTI in the RF in patients with hemiparesis with inappropriate RF activity in mid-swing.33 However, there were no significant improvements in functional tests of gait capacity (gait speed, gait distance assessed during the 6 min walking test, stairs). Taken together, the results obtained in the upper and lower limbs after a single BTI session suggest that, although this treatment reduces muscle tone and increases passive function, its impact on active function is low and it does not improve activities of daily living. 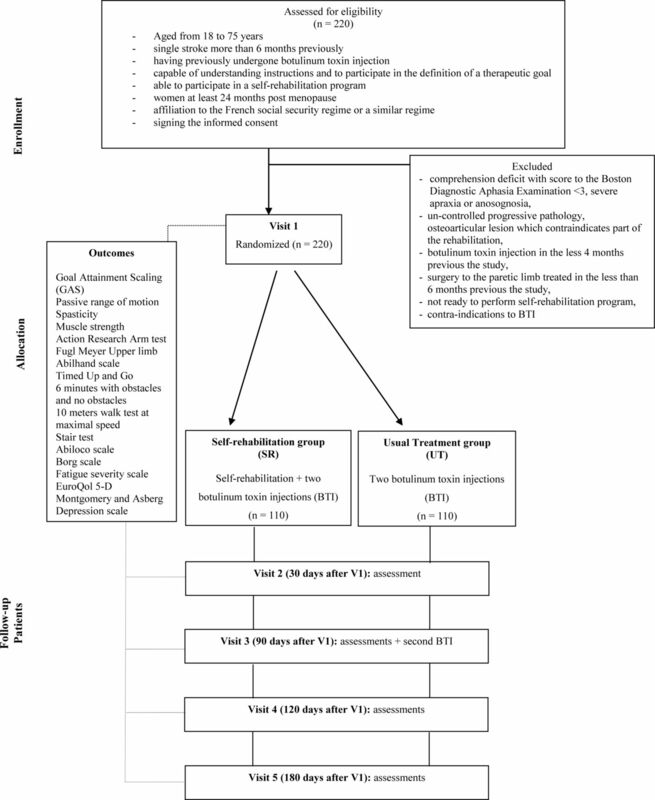 Some authors state that conventional outcome measures used in these previous studies are not suitable.30 34 35 They suggest using an individually based approach such as the Goal Attainment Scaling (GAS) which showed significant improvements following BTI.34 35 GAS determined the primary treatment goal which is the main treatment objective determined jointly by the patient and the therapist. In view of all these studies, it appears essential to develop a combined therapy approach to improve the treatment of spasticity and functional activities in daily life. To increase the intensity of the oriented rehabilitation following BTI would be indeed relevant. Sun et al 39 highlighted greater improvements of spasticity, active function and use of the paretic upper limb of patients with stroke when a constraint-induced therapy is coupled with BTI in comparison with less intensive rehabilitation.39 Similarly, Roche et al showed that a 30 min daily SR programme of 4 weeks coupled with a single session of BTI in the lower limb significantly improved several gait-related activities compared with BTI alone.40 The SR programme was developed to combine safe and feasible exercises combining 10 min of strengthening, 10 min of stretching and 10 min of task-oriented gait-related exercises. Eighty-three per cent of the patients in the SR group carried out 33 min exercises per day more than 5 days per week.40 These results show that combining SR at home with BTI seems effective, well accepted and well tolerated. Results of these pilot studies with restricted sample suggest effectiveness of adding sessions of specific exercises following BTI in patients with stroke, which corresponds to the conclusions of two recent reviews.41 42 These reviews recommend however further study with large sample size, long duration and robust methodology. The aim of this study is to assess the effects of a 6 months SR programme in adjunction to BTI, in comparison with BTI alone, to reduce limitations of patients with spasticity having a stroke. All previous results lead us to the hypothesis that the addition of a specific 30 min SR programme to repeated BTI and usual physiotherapy should increase the proportion of patients who attain their primary treatment goal (impairments and functions assessed with GAS) more than usual care (involving repeated BTI and conventional physiotherapy), in poststroke outpatients with spasticity. Secondary objectives are to compare the effects of the two therapeutic strategies on impairments and functional status, on quality of life, mood, fatigability and fatigue of patients with stroke and evaluate the time course of the effects. Another aim is to assess compliance with, and tolerability of the SR programme, and to define the characteristics of compliant and non-compliant patients. This study is a multicentre, prospective, assessor blinded, randomised controlled, study with parallel groups of a 6-month SR programme in addition to standard treatment (usual physiotherapy and two consecutive BTI at an interval of 3 months) versus standard treatment alone. The inclusion criteria are: men and women aged from 18 to 75 years, women at least 24 months postmenopause, having undergone surgical sterilisation or using an effective method of contraception, affiliation to the French social security regimen or a similar regimen, single stroke more than 6 months previously (previous transient ischaemic attack is accepted), having previously undergone BTI (last injection must have been performed at least 4 months prior to inclusion), capable of understanding instructions and to participate in the definition of a therapeutic goal, able to participate in an SR programme (cognitive functions and test session with the therapist) and signing the informed consent form indicating that the subject has understood the aim of the study as well as the procedures involved and that he/she accepts to participate and adhere to the study. The exclusion criteria are: subjects who are not ready to perform the SR programme, subjects who do not have health insurance, pregnant women, uncontrolled progressive pathology, comprehension deficit with score to the Boston Diagnostic Aphasia Examination <3, severe apraxia or anosognosia, osteoarticular lesion which contraindicates part of the rehabilitation involved in the study, patients with other interventions planned prior to the end of the study period (orthosis, surgery, etc), surgery to the paretic limb treated in the less than 6 months previous the study, contraindications to BTI, patients under guardianship. After eligibility is confirmed, details of the study will be explained and participation to the study will be proposed to patients with stroke-related spastic hemiparesis followed in 16 participating physical medicine and rehabilitation departments, for whom BTI is planned and who undergo usual physiotherapy. Settings and locations where the data will be collected. Data are recorded and managed through a dedicated web-based software (Cleanweb Telemedicine) with secured and restricted access. Access to the system is controlled for each investigator by an individual login/password and using a secured https connection. Data are stored on a centralised server. Participants also have paper files which are anonymised and only contain the participant’s unique identification code. These are stored in a dedicated storage unit in each centre. Access to the complete final trial dataset will be restricted to the Clinical Research Unit statistician who will analyse the study data for the purpose of report and publication. Subsets of the final dataset may be shared with investigators if needed for discussion or additional analyses. Should the need arise, advice from the steering committee will be sought and provided to the sponsor Assistance Publique Hopitaux de Paris who will retain ownership of the data as well as the final decision on authorising further access to data. Each patient will participate in five visits over 6 months. At visit 1 (V1, inclusion visit) and visit 3 (V3, 90 days after V1), patients will be assessed and injected with botulinum toxin. Patients will be also assessed at visit 2 (V2, 30 days after V1), visit 4 (V4, 120 days after V1) and visit 5 (V5, 180 days after V1). SR group: SR program +two repeated BTI. Usual treatment (UT) group: two repeated BTI. All patients will be able to continue their usual physiotherapy. However, we stipulate to the patients not to inform their physiotherapist of their participation to the study not to change their usual care. For patients in the SR group, the programme will be based on the three dimensions of rehabilitation described above: stretching, strengthening and task-oriented exercises, which correspond to current recommendations.42 44 Two exercises will be selected by a therapist for each of these 3 dimensions (total of 6 exercises) from a list of 50 exercises. The selection of exercises will be based on the primary treatment goal. The patients will receive an exercises booklet containing an illustrated description of the exercises they have to perform at home and the duration for each exercise. These exercises are extracted from a booklet, available in online supplementary file of this article. The patients will be instructed to carry out a session of exercises during 30 min (including 10 min within each dimension) each day, 7 days per week, 6 months of their participation in the study. All the exercises will be taught to the patient by a physiotherapist who is not involved in the patients follow-up, during V1, following randomisation to the SR group, as well as during V3 (second BTI), if the exercises are changed. The therapist will make sure that the patient is able to perform the exercises alone. Patients will receive a compliance log book where they will annotate exercises they carried out and for how long, after each exercise session. This book will be used to evaluate compliance and tolerability of the programme. Every 2 weeks, patients in the SR group will receive a telephone call for the whole duration of the SR programme in order to ensure that they are not encountering any difficulties, as well as to maintain motivation and ensure that the patient is completing the compliance log book. Any adverse effects will be documented. At V3, changes may be made to the SR programme, patients will be thus taught the new exercises. After acceptance, each patient will undergo all assessments at each visit. The primary outcome variable is the percentage of patients attaining their primary treatment goal which is determined before randomisation jointly by the patient and the doctor performing the BTI using GAS.45 According to previous studies, standardised outcomes appear to have an inadequate sensitivity and to be not representative of patients’ needs for assessing changes in functional disability following BTIs.34 46 47 In contrast, GAS appears sensitive, provides an accurate indication of success in relation to the intended goals of upper and lower limbs spasticity treatment, and strongly correlated with its reduction (evaluated with the modified Ashworth scale, most widely used scale).34 35 The goals will be personalised as is the case in routine practice. Botulinum toxin will be injected according to the primary treatment goal. The injected muscles and the dose will thus be adapted for each patient. As suggested in the original scoring of the GAS and in studies using this evaluation to assess spasticity management with BTI, the patient’s initial state is assigned a score of −1.34 45 If the goal is attained, a score of 0 will be assigned. Improvement above what is expected (somewhat better than expected =+1 or much better than expected =+2) as well as worse than expected (−2) will also be defined. In order to reduce the heterogeneity of the individual goals, a list of domains has been predetermined, based on data in the literature and consensus by national experts. The domains and examples of goals relating to each domain are provided in online supplementary appendix of the protocol. The secondary outcome variables involve range of motion using a manual goniometer, spasticity evaluation using the modified Ashworth scale, muscle strength evaluation using the Medical Research Council scale, function of the upper and lower limb, quality of life, mood, fatigability and perceived fatigue. Action Research Arm Test composed of four subsections: gross arm movements, grasp, grip and pinch. Nineteen motor tasks are graded on a 4-point scale (0–3) and the maximum score is 57. Fugl-Meyer, upper limb items which assess voluntary movements with synergy, voluntary movements without synergy, mass finger flexion, mass finger extension (active or passive), prehension, and movement coordination and speed. Abilhand scale, a self-report questionnaire composed of 23 questions regarding the ability to carry out specific upper limb activities. The patient indicates if the task is impossible, difficult or easy. Timed Up and Go test which evaluate functional gait ability including gait and balance. It involves rising from a chair, walking 3 m, turning and returning to sit. Performance is timed and indicates the patient’s functional capacity. Ten-metre walk test at maximal speed: the patient is timed while walking at maximal gait speed over the middle 10 m of a 14 m walkway. Two trials are carried out and the best performance is noted. Stair test: The patient is timed while ascending and descending 15 stairs as fast and as safely as possible. The turning time at the top of the stairs is not timed; the clock is stopped when both feet touch the last step. Abiloco Scale which is a self-report questionnaire composed of 13 items regarding the ability to carry out specific locomotor activities, which are scored as possible or not possible. Path of the 6 min walk test with obstacles and no obstacles. The fatigability and fatigue, quality of life and mood will be assessed using, respectively, the Borg scale (carried out immediately after the 6 MWT), the Fatigue severity scale, the EuroQol 5-Dimension and the Montgomery and Asberg Depression Rating Scale. The pain, compliance and tolerability of the SR programme will be assessed with the log book and the telephone calls (every 2 weeks). The type of exercise performed each day, the time devoted to each and the presence or absence of pain following each exercise will be documented in the log book. Pain will be also assessed with analogue scale (score between 0 and 10) during the telephone call. The occurrence of any adverse events (AEs) will also be checked during the visits and the telephone calls. Table 1 presents assessments during the five visits for each group. Figure 2 shows the study flow chart. All patients with stroke followed in hospitals involved in this study, for treatment of their spasticity will be offered to participate in this study if they meet the criteria for inclusion. Because there is often a discrepancy between significant improvement in patient’s global assessment (subjective rating of problem severity) and scores on standardised measures, the GAS is chosen as primary outcome, based on patient’s priorities. Patients included in the SR group will assess themselves the difficulty of exercises. At the end of the study, participants will be informed of the results by letter and/or mail. The primary criterion is the proportion of patients who achieve their primary treatment goal using GAS. According to studies of Turner-Stokes et al 49 and Demetrios et al 50 which both used GAS, this proportion should be between 75% and 80%.49 50 Based on a usual effectiveness of 75% in the control group, a target proportion of 90% in the SR group (supposing further improvements for this group, threshold relatively superior to 75%, reasonable and clinically relevant), a two-tailed test at a threshold of 5% and a power of 80%, a sample of 100 subjects per group is required.51 In order to take into account the possibility of patients lost to follow-up (estimated at less than 10%), we will recruit a total of 220 patients. The centralised randomisation procedure implies randomisation list, stratified by centre with a 1:1 ratio between the two groups (SR group vs UT) and with unrevealed varying block sizes, will be prepared by the biometry unit (Unité de Recherche Clinique Paris Ile de France Ouest) and verified according to the AP-HP sponsor procedures. It will be available on CleanWeb. To respect the blinding, the doctor will be instructed not to try to ascertain to which group the patient has been randomised, the same evaluating physiotherapist will be blinded to the treatment group and the patients will be instructed not to discuss the treatment they receive with any of the clinicians (injecting doctor, evaluating physiotherapist and physiotherapist carrying out the conventional therapy). An AE is defined as any untoward medical occurrence in a participant which does not necessarily have a causal relationship with this study. These can be identified at any moment during the study. A serious AE includes: death, risk of death, necessity or prolongation of existing hospitalisation, persistent or significant disability or incapacity or any other undesirable event considered to be medically significant. The sponsor’s vigilance unit is in charge of the causality. Clinical research assistants from the sponsors research unit regularly visit all centres for on-site monitoring to ensure protocol compliance and monitor data quality according to the data management unit guidelines and clarification forms. Data entered into Cleanweb should be complete and consistent with source documents. Eligibility criteria and consent forms are checked as well as outcome measures and AEs. No interim analyses are planned. Quantitative data will be described by means and medians, SDs and IQRs. Nominal data will be described by percentages with 95% CIs. Patient characteristics will be described by centre and compared. Quantitative data will be compared using t-tests or non-parametric tests (Wilcoxon rank-sum test) when the distribution does not approach symmetry even after suitable transformation (Tukey’s ladder of powers), for instance, for the GAS T-score. Categorial data will be compared by means of χ2 tests or Fisher’ s exact tests. The analysis of the primary objective will be performed by calculating the 95% CI of the difference in the proportions of success: Experimental—Control, that is, (SR+rTBI+ UP)—(rTBI+UP). SR will be considered as effective if the lower limit of 95% CI of difference is above 0. The main analysis will first be performed on intention-to-treat (ITT) groups. As a secondary analysis, a logistic regression model, with a fixed factor corresponding to the randomisation arm (SR yes/no, coded 1/0), centre being considered as a random factor, taking into account other prognostic factors, notably severity of stroke and age, and their interactions with the randomised treatment, will be developed. The analysis of the effect of the intervention on secondary criteria: impairments, function, fatigue, mood, quality of life, will be performed using Generalised Linear Model regression models, whose link function and distribution of errors will be chosen according to the nature of the response: logistic and binomial if the response is binary (achieving goal, ie, 0–1), cumulative logit and multinomial if the response is ordinal (GAS T-score), identity and Gaussian if the response is considered continuous. Main secondary analyses will be unadjusted. Additionally, after bivariate screening, the main confounders (notably age) and interactions with treatment will be tested in a multivariate model. The shape of the relationship of continuous factors will be explored by fractional polynomials. Goodness of fit will be verified (influential observations, R2, discrimination, calibration) and performance of the models will be assessed by Akaike information criteria. These analyses will be performed on the ITT groups, except for safety or tolerability criteria which will be analysed on per-protocol populations. Procedures for dealing with missing data will depend on the degree of missing data and the suspected mechanism.52 If missing data are less than 15% for a given variable, we will perform simple conditional imputation. In the case of a large degree of missing data, sensitivity analysis, using multiple conditional imputations (Multivariate Imputation by Chained Equations), will be required. Our study would be the first to evaluate the effects of adding SR to repeated BTI on targeted treatment goals, impairments and activity limitations, in a large number of patients with an appropriate follow-up period. If our hypothesis of an effectiveness of SR to optimise the effects of BTI is validated, it would be an approach to recommend with little additional cost to the already limited health system budget. These results will also assess the adhesion and the tolerance of an SR programme in adjunction to spasticity UT. It might permit to demonstrate also that the effect of combining SR should on one hand permit to maintain the attainment of primary goal treatment more longer than conventional therapy and on the other hand allow to improve others fields such as fatigue, fatigability, mood and quality of life. The protocol version is V.2.1 and dates from 28 September 2017. The results will be disseminated in a peer-reviewed journal and presented at international congresses. The results will also be disseminated to patients. The authors are grateful to all study participants and team members as well as supporting staff. This study is possible thanks to the collaboration of numerous researchers, clinicians, technicians, engineers, research assistants and Allergan laboratories. We would like each individual member of the study group to be searchable through their individual PubMed record.
. La prévention et la prise en charge des accidents vasculaires cérébraux en France. Synthèse du Rapp à Madame la Minist la santé des Sport, 2009.
. Upper motor neurone syndrome and spasticity. Clinical management and neurophysiology. Cambridge, 2008.
. Interventions for improving upper limb function after stroke. Cochrane database Syst Rev 2014;11:CD010820.
. A systematic review of repetitive functioal task practice with modelling of resource use, cost and effectiveness. Health Technol Assess 2008;12:1–140.
. Etude de l’autonomie des patients hémiparétiques au stade chronique d’un accident vasculaire cérébral en médecine générale, 2010.
. Physical activity and exercise recommendations for stroke survivors: an american heart association scientific statement from the council on clinical cardiology, subcommittee on exercise, cardiac rehabilitation, and prevention; the council on cardiovascula. Circulation 2004;109:2031–41.
. Improvement in the Gait Pattern of Chronic Stroke Patients following Repetitive Multifocal Botulinum Toxin Injections: An Observational Study. Int J Phys Med Rehabil 2015;3:521–4.
. World Health Organization. Stroke–1989. Recommendations on stroke prevention, diagnosis, and therapy. Report of the WHO Task Force on Stroke and other Cerebrovascular Disorders. Stroke 1989;20:1407–31.
. Statistical analysis with missing data. New York: John Wiley, 1987. Contributors NR and DB conceived of the study. NR and CB mostly drafted the manuscript. CB organised patient visits and performed the patients evaluations. PD, PM, CA, FP, M-EI, FCB, FM, J-CD, PD, PG, BP-V, NB, EC, DP, N-YD-S, JR and IL participated in the design of the study and helped to draft the manuscript. JR is the assistant coordinator of the clinical research unit, his team ensures the regulatory follow-up of the study and the monitoring of the data. All authors, the ADJU-TOX Study Group, read and approved the final manuscript and will be involved in the patients recruitment or monitoring. Funding This study is sponsored by the Assistance Publique Hôpitaux de Paris who received a grant from the French Ministry of Health after selection in the 2015 call for projects (Programme Hospitalier de Recherche Clinique-PHRC national 2015, AOM15495) and conducted in collaboration with Allergan laboratories, monitoring and data management being performed by the Unité de Recherche Clinique Paris Île-de-France Ouest (URCPO). Ethics approval This study will be performed in accordance with the ethical codes of the World Medical Association and will be approved by the local ethics committee. The Committee for the Protection of Persons (CPP) Ile de France 8 (Hospital Ambroise Paré) approved the study and the reference number is 16 07 53. Collaborators Bernard Parratte, Théo Maulet, Philippe Aegerter, Priyanka Velou, Julia San, Yassine Omri, Myriem Carrier.